The Gold Rush Trail tour is approximately 1,900 km (1,188 mi) long and can take between 7 and 10 days to drive. Many of British Columbia’s highways follow the trails used by the early gold seekers. All along these routes are artifacts and remnants of the early pioneers. Drive this tour and relive their journeys through steep canyons, raging rivers, and high mountain passes. The roads are greatly improved, but the scenery is as rugged as ever. From New Westminster, travel Highway 1 east to Yale (171 km / 103 mi). Head up the Fraser Canyon to Cache Creek(169 km / 101 mi) and take Highway 97 north to 150 Mile House (187 km / 116 mi) and take a side trip to Likely (85 km / 53 mi) or Horsefly (52 km / 32 mi) then return to Highway 97 and continue to Williams Lake (18 km / 11 mi). From Williams Lake head towards Quesnel (119 km / 72 mi) and take a side trip from Quesnel out to Wells/Barkerville (88 km / 53 mi), and then head back up Highway 97 to Prince George(119 km / 72 mi). From Prince George travel east towards the Rockies and Valemount on Highway 16 (270 km / 162 mi), then follow the North Thompson River south to Kamloops (337 km / 202 mi). Merritt is south of Kamloops along Highway 5A (95 km / 57 mi), which leads to Highway 1 and back west to Vancouver (251 km / 140 mi). The Gold Rush Trail starts in New Westminster at Irving House Historic Centre, one of the oldest buildings in British Columbia. Irving House Historic Centre provides visitors with an opportunity to explore the history of the province’s first capital and commercial hub of the Lower Mainland. The New Westminster Museum houses a collection of Royal Engineers paraphernalia. It was the Royal Engineers who founded the ‘Royal’ City of New Westminster in 1859 and completed, in 1865, the Cariboo Wagon Road – then known as ‘the eighth wonder of the world’. The Gold Rush Trail began with the discovery of gold along the Fraser River in the Cariboo Region when the Hudson’s Bay Company shipped 800 ounces of gold to the Federal Mint in San Francisco on the steamship Otter in February 1858. The rumour of a steamship with gold had men and women heading north in search of riches. More than 30,000 prospectors sailed north during the summer of 1858, and most of these men reached the goldfields via Victoria. The miners came first to Victoria to obtain a valid mining license, which permitted them to prospect for gold. From New Westminster follow Highway 1 east to Fort Langley. As the Fraser Valley’s first European settlement, Fort Langley served as a trading post and provisioning station for men heading off to the goldfields. They travelled by steamer from Victoria to Fort Langley. Today Fort Langley is a national historic site and showcases what British Columbia life was like in the early 1800s. The Fort has working exhibits and you can see how people panned for gold. The sand bars of the Fraser River were a disappointment to many miners but they continued working their way up the river. 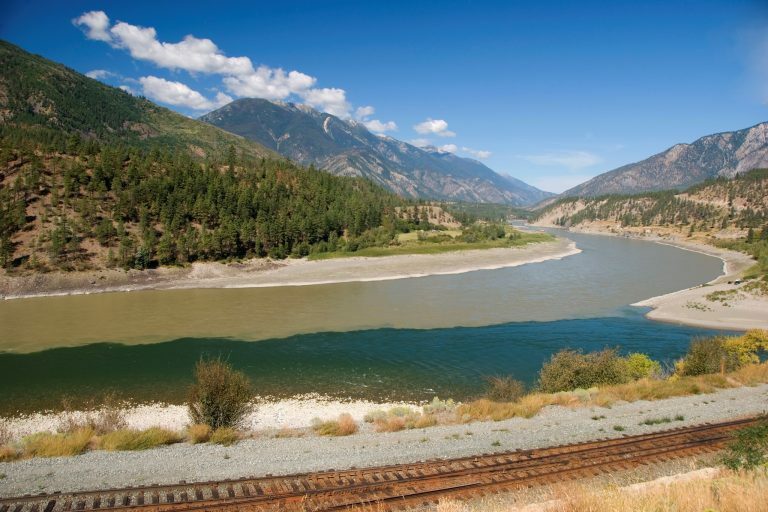 The original prospectors travelled the Fraser River by steamer up to Yale, but you will travel by road via Highway 1 on the south shore or Highway 7 on the north shore up the Fraser River. This point marks the official beginning of the Gold Rush Trail, as the river beyond Yale was too rough for steamers to navigate. St. John the Divine, one of British Columbia’s oldest churches (built in 1863) still stands in Yale, and the Yale Museum is a fascinating place to visit too. By 1862 many gold prospectors had reached the Cariboo in the southern interior and as wave after wave of eager gold miners arrived, the influx created transportation problems that led to the construction of the Cariboo Wagon Trail by the Royal Engineers. The trail starts officially at Yale, but mile zero starts at Lillooet. From Yale, the traveler follows Highway 1 north through the Fraser River Canyon along the wagon trail. As the gorge narrows, the road winds through rocky cliffs. The narrowest point along the whole river is at Hell’s Gate, south of Boston Bar. Take an aerial tram down into the gorge for a close look at the raging river and spend some time at the international village. At Lytton, the Thompson River meets the Fraser. Venture to the riverbank and see the fine line between the azure Thompson and the muddy waters of the Fraser. In this area, rafting is a favorite pastime of active adventurers. From Lytton you will take Highway 12 to Lillooet, following the old Cariboo Wagon Trail. Highway 12 takes you into an arid high mountain region that records some of the hottest temperatures in Canada. It is here that the Coastal Mountain range meets the semi-arid desert created by the rain shadow of the mountains. Just east of Lytton is the Stein Valley Heritage Park, the last major, biologically complete unlogged valley in British Columbia. The park contains 14 ecological zones and offers the visitor an opportunity to visit all of the zones. Lillooet sits on the dry flats of the Fraser River Canyon at the foot of the rugged Coast Mountains. It was here the Governor of the Colony of British Columbia set Mile 0 of the Cariboo Wagon Road. Lillooet is the gateway to a mountain adventure playground. To the east are Pavilion Lake and Historic Hat Creek Ranch. To the west lie Tyaughton Lake, Gold Bridge, and the momentous Pioneer-Bralorne goldfields, and the Southern Chilcotin. The spectacular Fraser River Canyon hosts native salmon fishing sites, the Seton salmon spawning channels, numerous sturgeon and ginseng farms. The Cariboo Wagon Trail was dotted with roadhouses built in areas where grass and water were plentiful and vegetables and crops could be grown. Those who were unsuccessful in mining often stayed in the Cariboo starting up roadhouse businesses to become the first pioneers in the new agriculture and business communities. One such roadhouse is Historic Hat Creek Ranch, which is 11 km (16.6 mi) north of Cache Creek. On the ranch, travelers can tour through restored buildings or take a wagon ride on the original Cariboo Wagon Road. The roadhouses were named after the mileage along the Cariboo Wagon Road, so as you travel Highway 97 north you pass 70 Mile House, 100 Mile House, and 150 Mile House. From Lillooet the traveler takes Highway 97 north to Clinton, originally known as 47 Mile House and now called the ‘Gateway to the Cariboo’. Clinton’s main street retains a western flavour, likely from the times when it was the meeting place of the wagon roads from Lillooet and Yale. In those days, the proprietors of Forty-Seven Mile House bragged of a well-stocked saloon, great food, friendly hosts, and seven rooms. Clinton’s museum is filled with memorabilia and old photos and the local antique and craft stores provide lots of browsing opportunties. 100 Mile House, one hundred miles up the road from Lillooet, displays one of the stagecoaches that used to travel the road over a century ago. This small community dates back to the early pioneer days when it was called Bridge Creek, a rest stop on the fur trade route north. Its name comes from the gold rush days when a stagecoach stop was set up to refresh travellers 100 miles from Mile 0 at Lillooet. Although the original roadhouse is no longer standing, the area remains an important service centre for the South Cariboo. A visit to Centennial Park is a great place for a picnic by the creek. 100 Mile House is also home to some of the world’s finest cross country ski trails and the annual 50 km (30 mi) Cariboo Marathon attracts almost 1,000 participants annually in the first week of February. Summertime brings camping and fishing enthusiasts to the hundreds of lakes in the surrounding area. 108 Heritage Site and Museum is another great place to stop and stretch to enjoy an informative tour of the historic buildings. At 150 Mile House visitors can take a side trip to Likely or Horsefly. In 1859, local Indians showed gold seekers the location of gold deposits in now historic Horsefly, sparking the great Cariboo Gold Rush. Located 60 km (36 mi) east of 150 Mile House, on the south branch of the Old Gold Rush Trail, Horsefly today is a forestry centre and the gateway to fabulous camping, hiking, and fishing in the surrounding area. Horsefly Lake is 50 km (30 mi) long and 650 ft (200 m) deep, with crystal-clear, clean water. You can fish for large rainbow or the lake trout that Horsefly Lake is renowned for. Located in a picturesque setting on the mouth of the Quesnel River, at the west end of Quesnel Lake, the town of Likely is one of the few remaining old gold rush settlements. Originally known as Quesnel Dam, the town was renamed in honour of John A. Likely, who was connected with the bullion mine. Quesnel Forks was the site of the earliest mining camp in the Cariboo. It is a hauntingly beautiful ghost town at the end of a narrow mountain road, 13 km (9 mi) northwest of Likely. Williams Lake, back on Highway 97, lies a few miles north of 150 Mile House and is the gateway to cattle country. In early July it is home to the William’s Lake Stampede. The city boasts a unique downtown core with many original and one-of-a-kind shops, as well as a 50-store mall and all modern amenities. The city’s rich culture and history are evident in the Station House Art Gallery, the BC Cowboy Hall of Fame and the Museum of the Cariboo-Chilcotin that portrays the area’s Western Heritage. Scout Island Nature Centre, situated on Williams Lake, and the First Nations Xatsu’ll Heritage Village offer a fun and educational opportunity for the whole family. Further along Highway 97 is the town of Quesnel, which calls itself the ‘Gold Pan City’ and features the world’s largest gold pan. Visitors shouldn’t miss the Quesnel and District Museum and Archives, with Mandy, the famous haunted doll. The Arts and Recreation Centre has a pool, art gallery, and gym. A new attraction, the Antique Machinery Park, houses interesting old machinery. From Quesnel, all visitors in search of gold must head east on Highway 26, 88 km (53 mi) to reach Barkerville, one of British Columbia’s must-see attractions. This restored ghost town has over 120 buildings and businesses that operate as they would have during the peak of the gold rush. During your stay in Barkerville, you can pan for gold, enjoy a show in the Theatre Royal, take a town tour, or listen to a specialized talk. You can also make your way to the Richfield Courthouse to hear Judge Begbie’s stories of goldfield justice. Costumed historic interpreters will make your visit amusing, authentic and interesting. Follow the highway further east to Bowron Lakes Park and spend a quiet day in a canoe or a whole week on a paddling adventure. Backtrack from Barkerville along Highway 26 to Highway 97 and north on to Prince George, located at the northern end of the Gold Rush Trail. The Huble Homestead near Prince George was the roadhouse for the gold rush stopover for those venturing to the Barkerville goldfields from the north. Today, Prince George is the gateway city to Northern British Columbia. Highlights of Prince George include the Two Rivers Gallery, the city’s showcase for exhibits of visual art by local, provincial and other Canadian artists. Don’t miss the Prince George Native Art Gallery, with its wealth of prints, carvings, jewellery, and beadings by First Nations artists from Prince George and across the province. Award-winning Exploration Place at the Fraser-Fort George Regional Museumhas a variety of exhibits of local, cultural, and natural history. The Railway and Forestry Museum has an extensive collection of rail and forest industry artifacts, which spans the whole of the twentieth century. From Prince George follow Highway 16 east into the Rockies 275 km (171 mi) towards Tete Jaune Cache. Tete Jaune Cache is at the confluence of the Fraser and Robson Rivers, and marks the intersection of the Yellowhead Highway 5 and Yellowhead Highway 16. Tete Jaune Cache, the Yellowhead Highway and Yellowhead Pass were named after a fur trader and trapper who guided for the Hudson’s Bay Company in the early 1800s. The yellow-haired Iroquois Metis guide Pierre Hastination (also recorded as Pierre Bostonais), was named Tete Jaune by the French voyageurs because of his blonde-streaked hair (Tete Jaune means yellow head in French). By the 1830s, the Yellowhead Highway was truly being used as a trans-Canada highway. Red River carts rolled along it in 1841, miners used it for the Caribou Gold Rush in 1856, the 1862 Overlanders followed it to Kamloops and Prince George, and settlers followed it to their new homesteads in the West. When you travel south on Highway 5 from Tete Jaune Cache you will be following the North Thompson River, the route of the Overlanders. Travelling to the gold fields by land from Ontario, many of these settlers died while struggling to cross the country. The settlement of Valemount just 25 km (16 mi) south of Tete Jaune Cache is the gateway to Mount Robson Provincial Park. It is well worth taking a side trip to see the snowy face of Mt Robson, the highest peak in the Rockies. The history of Valemount dates back to the arrival of the first European fur traders, David Thompson and Pierre Hatsination, around 1805. The Overlanders passed through the area in 1862, en route from Ontario to the Cariboo Goldfields. Further south 197 km (122 mi) on Highway 5 is Clearwater. This part of the Thompson Valley was inhabited by First Nations people when the first explorers ventured south through the mountains in the 1860s, in their search for gold in the Fraser Valley and the Cariboo. Today Clearwater is a vacation paradise, with the majestic mountains of the world famous Wells Gray Provincial Park serving as a picturesque backdrop. Visitors should take a day trip in the pristine beauty of Well’s Gray Provincial Park and hike to the spectacular Helmcken Falls and other amazing viewpoints. From Clearwater, the route continues south on Highway 5 for 126 km (78 mi) to Kamloops. Situated at the confluence of the North and South Thompson Rivers in the Thompson Valley, the sprawling city of Kamloops takes its name from the First Nations word ‘Kahm-o-loops’, meaning ‘meeting of the waters’. Gold Rush fever in the 1850s and the construction of the Canadian Pacific Railway in the 1880s contributed to the rapid expansion of the settlement. Until the 1860s, the Fort at Kamloops was an important depot for the horse-drawn pack trains that travelled to and from the coast. Today, Kamloops is the third largest city in the southern interior of British Columbia, and the fifth largest in British Columbia. The colourful history and personality of Kamloops is captured under one roof at the Kamloops Museum. Leaving Kamloops south on Highway 5 (the Coquihalla Highway), the first community of note is Merritt, 88 km (55 mi) in the heart of the Nicola Valley. The Nicola Valley has long been home to a number of First Nations peoples; European pioneers searching for a trading route between the Coast and the Interior reached the area in the mid-1800s. Right from the beginning, early settlers were attracted to the area because of its rich grasslands ideally suited for livestock, and today, ranching continues to be an important part of Merritt’s economy. In Merritt make sure you visit Nicola Ranch, where the history and traditions of the Old West are kept alive. After a hot day on the range, stop for a cold drink at the historic Coldwater Hotel. It’s as much a part of Merritt today as when it was built in 1908. For the final leg of the Gold Rush Trail tour, take the Coquihalla (Highway 5) south from Merritt through the mountains, stopping at the toll booths located at Coquihalla Pass, and onto Hope and the lush fertile Fraser Valley. Once in the Fraser Valley, the traveler is only an hour’s drive from Vancouver, heading west along Highway 1, and completing the tour.